Matt, Dano and Kids: BouLdeR CitY! I have always loved Boulder City. The quaint, small town feel that is there is so comforting for me. You actually see kids walking down to the local candy store by themselves and you feel that it is ok. 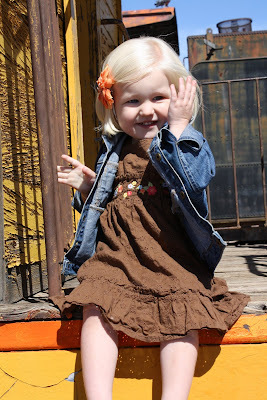 I took the kids out there to day to take a few pictures of Ava for her 2nd birthday. After the always fun and non-stressful task of taking pictures of four totally cooperative kids, we headed into the historic part of town to do a little exploring. I had noticed a small candy and ice cream store a while ago and wanted to give it a try. It was so cute. They have a lot of old fashioned candy and they also make hand dipped chocolates, carmel apples and fresh salt water taffy. It is called Grandma Daisys in case any one wants to check it out. Down the street from the candy store there is an antique store that had a sign for glass blowing demonstrations. We decided to check it out. The store itself is full of antiques and a lot of hand made crafts. A lot of the crafts are made by senior citizens that are "supplementing their social security" as I was told by the sales clerk. The glass blower was a 72 year old man. He showed the kids how he makes the little animals and made each of them a small item to take home. Looks like you all had a lot of fun! Today we wanted to wish a HAPPY BIRTHDAY TO AVA! The pictures look great. I will have to take my kids downtown one of these days. I hope you guys have a great Easter Holiday!